Beyond traditional vending, some of our customers have chosen to subsidize the cost of products to lower the vended price. While subsidies represent an expense to the company, there's no question it leads to happier employees, which is well worth it! Joyce Vending & Food Service provides the finest office coffee service by delivering the right equipment, top brands, popular flavors, and all the necessary supplies. Our hot brewed beverage solution, including an assortment of coffees and teas - in the morning and throughout the day - is a great, yet affordable, benefit to your employees. We provide our equipment at no charge to you and we continually monitor your break room to make sure it is fully stocked with all the necessary supplies. We know you have a choice in vending and office coffee service providers. 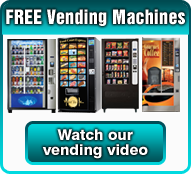 Let us prove to you that Joyce Vending is the best choice! We service the greater Akron area and surrounding communities. Please call us at 330.733.6800 or email us at info@joycevending.com to learn more.